Wrong decision to run with the wrong Dookies. A day of mistakes! If I can learn from them, all is good. If I don’t? Oh no. The mistakes started before I arrived. We left early in the am, and in the car, I had three large cups of hot tea, on the way up. By the time I arrived, I was dehydrated. I hit the bathroom 3 times in the hour leading up to race start. Dumb one, #1. After getting setup in transition, I surveyed the group. Lots of great looking athletes we there, and a lot of competitive triathletes were there, as it is still too early in the year for outdoor swimming events. Many of these folks who “go away” once tri season starts, but for now, transition was chock full of fast young people. Hard pause. The shortest guy in the group said, “Uhh…6 minute miles would be awesome today.” Boom, I found my pace car. I would find the Duke University jerseys at the start of the race and follow them. Mistake #2. I assumed that the shortest guy in the group was speaking for the group when he said six minute miles would be awesome. Before the start of the race, a couple of us were all sorting out what to wear. At 50-60 degrees, there were some choices. Cycling at 25 mph, the wind chill can really hurt your hands and feet. If the temp is close to 50, it can be painful to cycle in that weather, at that speed. If it is closer to 60 than 50, discomfort is minimal. In addition, the choice to wear windproof gloves and boots requires more time in transition to put on the extra layer and take it off when done. I made the decision to bundle up. I hate cold feet, especially when I have to run. Mistake #3. One woman in transition was wearing TeamUSA gear. She was tall and lean, and others were talking to her. I approached her and asked her if she still competed with TeamUSA. She hesitated and said, “I am a 4 time National/World Champion, so, yeah.” Don’t know if she said National or World. Didn’t matter. Her tone was one of pride and then some. “So, I just qualified for the team last year and am,” but wasn’t allowed to finish. 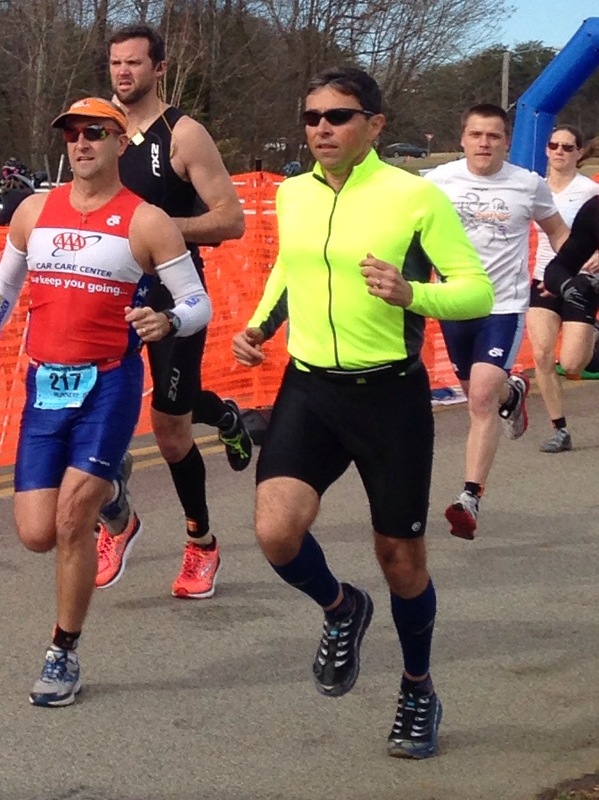 “I don’t compete with age groupers. They get in the way,” she said. I got cut off before I could start. Wow, that was hurtful. Where did that come from? I was seeking some wise counsel, and she decided to snuff out any sort of relationship with me, before it could start. That said, I could perceive that this was a chance to minister via prayer. “God, whoever hurt her, forgive them and help us all move on,” was my thought. No way was that mechanism of communication natural. Somewhere, in her past, was someone who hurt her. She was now passing that to me. Certainly, I didn’t deserve those words, but I suspect that she didn’t deserve the ones she got, either. Either way, she needed a nickname. As I walked towards the starting line, I set up, per my plan. Find the Duke guys and run with them. As the starting horn went off, I took off. For the first half mile, I ran with the lead pack. Impressive group. As I surveyed, I noted that I was, most definitely, the oldest guy in the pack. Then, like a freight train, I lost management of my breathing and heart rate. I was winded after only 2.5 minutes. Hold on, I thought. Half a mile in 2.5 minutes (+/-) means that I am running 5 minute miles. No wonder I was winded. Maybe I am just an age grouper. There were 20 + people ahead of me, all increasing the gap. I had to slow down. Then, as we neared the half-way point on the first run, I got passed by the “Duke guys”….the same Duke guys who told me that they hoped to run 6 minute miles. Dang it! I ran with the wrong Duke guys. Revisit Mistake #2. When we hit transition, I was next to Ms Happy. I had to sit down and change shoes, but I already committed to bundling up. I put boots over my shoes, load my pockets with food, put on my helmet and gloves, and run my bike out of transition. Ms Happy was gone from sight. She must have only changed shoes and put on a helmet. I lost in battle in transition, the place where I am historically the strongest. Good lesson the consequences of trying to stay warm. It cost me time. The countryside we saw while cycling was beautiful. Rolling NC hills in late Winter created some breathtaking views, as we crossed over creeks and climbed hills. My fitness was great, and the cycling wasn’t tiring. I tried to eat some portable rice balls, but they couldn’t go down. They were too dry, and I was still dehydrated. In any case, the ride was 10 or 11 miles, so there wasn’t enough time to run out of energy. When we came back into transition at the end of the bike, I again paid a price to being cozy. I had to take off boots and gloves, before I could start changing shoes. Linda later told me I took 90 seconds in transition. That is a minute more than it should have taken. I left transition, following a little guy dressed in green. He had a good pace, and I was having to push myself to stay with him. As we hit the second half of the run, both of us had passed a couple of people. I decided to make a move to get by him and discovered that he was a she! We crossed the finish line only a few seconds apart, and they announced that she was the 2nd place woman, overall. That meant Ms Happy had won the women’s side of the race. And, there she was, hunched over, breathing and resting after her race. I now have a goal. Beat MS Happy. She is a champion, yet, despite my poor performance today, she was only a few moments ahead of me. Had I not picked a path of warmth, the results might have been different. Had I not been dehydrated, who knows how I might have done. Maybe God is using this moment to give me a goal and a prayer opportunity, at the same time. Sort of a multi-tasking. I had a less-than-good race, but I have lots of room to improve. Isn’t that what a professional does? Analyze their efforts and learn from them. Today, I didn’t prepare correctly, and couldn’t tell the difference between a he and a she. On the ride home, we chatted through the mistakes. Next time, I am going to limit tea to 1 cup, on race day. I will more thoughtfully consider the choice to give up time in order to be warm. Lastly, I will run my race, not the Dookie’s race. Love learning from my mistakes, and they are many. I really love that you took the time to pray for Ms. Happy and realized that she has obviously been hurt to make her act this way. Nice race & great post! Which is worse – extra clothes or emotional baggage? In this race, it seems like the former. However, at least you got to the take the extra clothes off at finish line. Hopefully, she will too…….just at a different finish line. I think I agree with you. If you make mistakes and learn from them it can be a true gift. Making a mistake and not learning from it is a mistake in it’s self. Nice job on the race.